To do it on a 5 day itinerary, you can combine Ambarita (day 2) with the road trip (day 3), bearing in mind that things will be a little tighter. Alternatively, leave for Medan earlier on day 5 via private transport, making sure you’re not traveling on a peak travel period, and you may have time to do day 6’s stuff on day 5. The most popular entry point into North Sumatra is via Kualamanu International Airport at Medan. 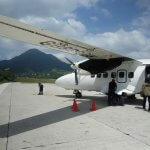 From the airport it is possible to transfer directly to Parapat by shared taxi. Upon leaving the airport terminal, turn right and just before the bus queues there is a queue for the company Nice Trans. It costs 80,000 IDR per person in a 6 seater, and if it doesn’t fill fast staff may try split the cost of the remaining seats among the traveling passengers. In our case we paid 100,000 IDR for them to leave with 5 people on board (3 in our group, 2 from another group). The road to Parapat is pretty bumpy and can be dangerous. 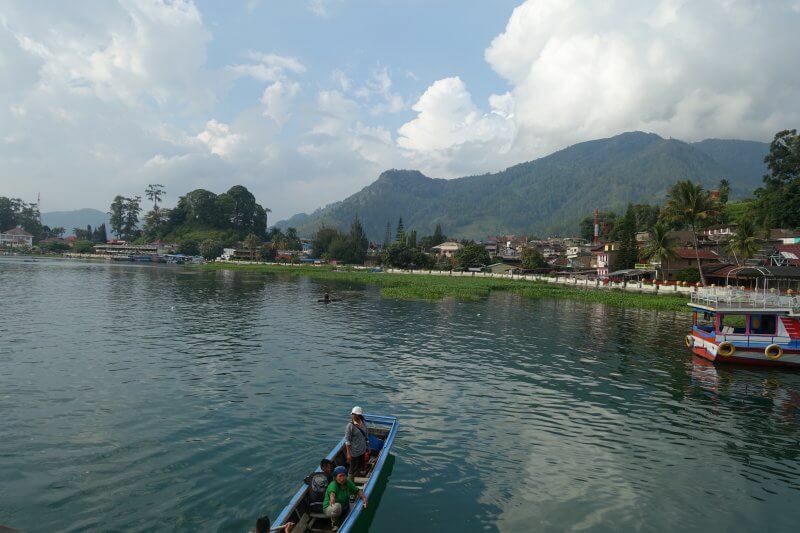 Leaving Parapat for Samosir Island in Lake Toba, by ferry. 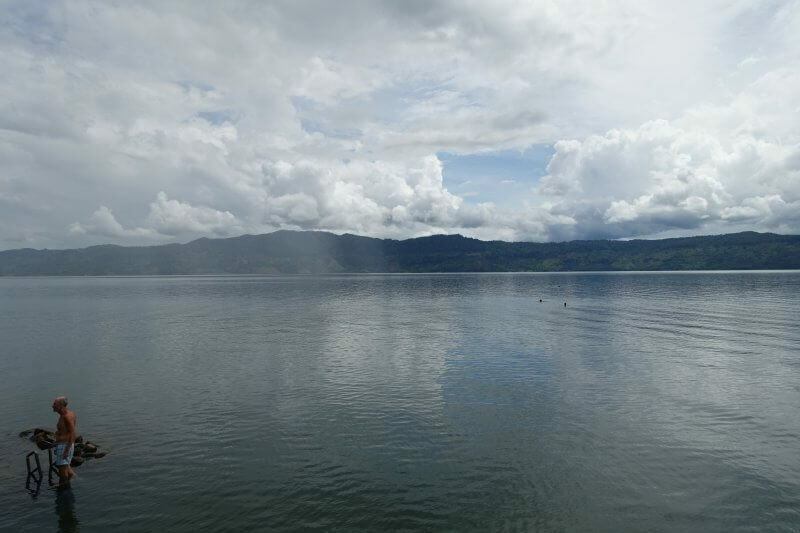 The ferry from Parapat (on the mainland) to Tuk Tuk (on Samosir Island, in Lake Toba) takes 30 mins and costs 15,000 IDR. 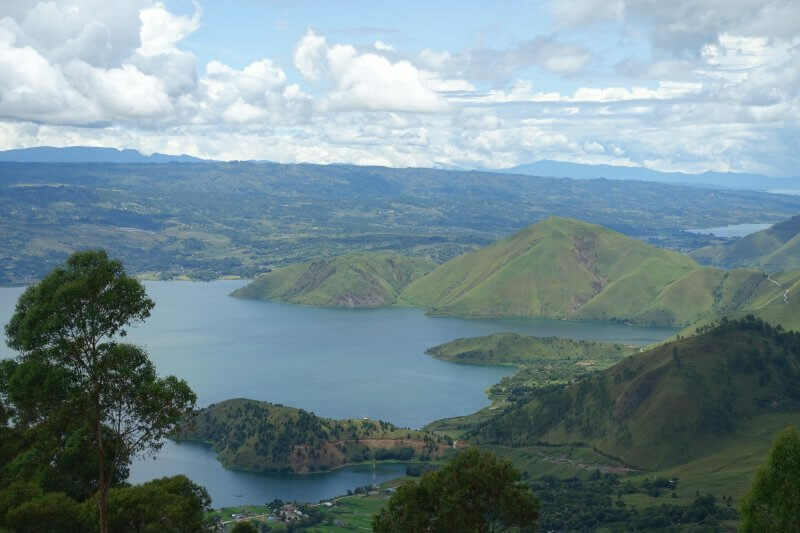 It was mind boggling just thinking that this gigantic lake is what remains of a supervolcano that erupted 70,000 years ago, and it took 30 mins just to travel to the island in the middle of the lake. Most of the tourism infrastructure are to the north of the island, and the chill vibes can be felt within minutes of stepping on the island. Might be worth more than a few days to escape the city buzz. View of the quieter side of Tuk Tuk. 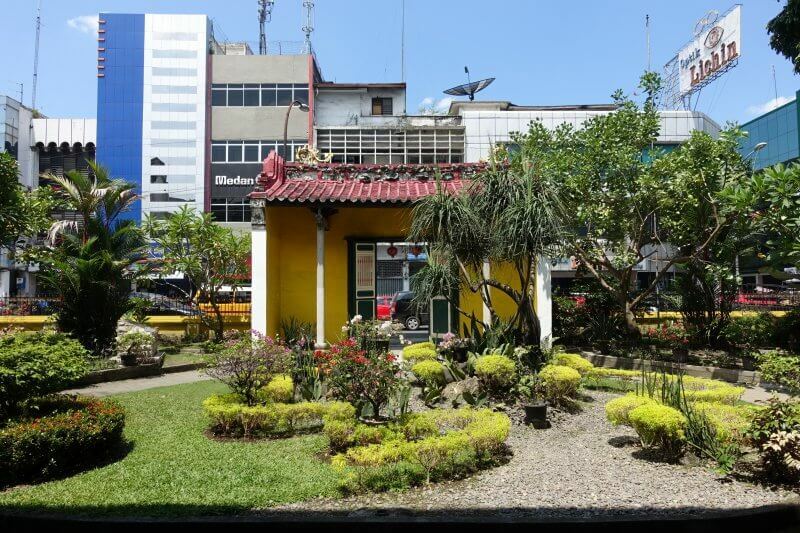 If you’ve arrived in Medan in the late morning it’ll probably be close to the evening by the time you’re settled down at your chosen hotel – there’s one for every budget. Just in time for a nice dinner by the lake. With such chill vibes it almost feels wrong to be rushing into any activity. Many of the guesthouses/hotels are by the lake, and hours can easily pass by just relaxing by it. Not your usual morning swim. Or just swing on a hammock. 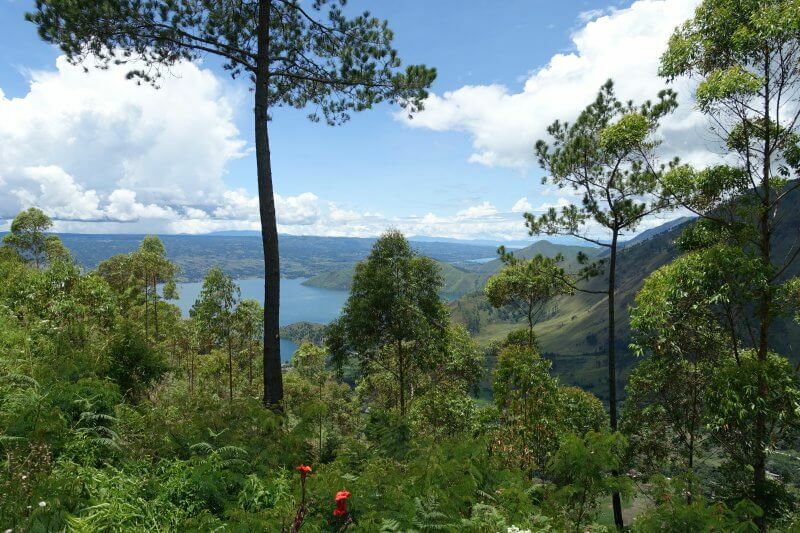 And if you get restless (like we did by noon), Ambarita is about an hour’s stroll away. There’re a couple of interesting sights in Ambarita. Nearing Ambarita, on one of the bends along the hills on the coast. 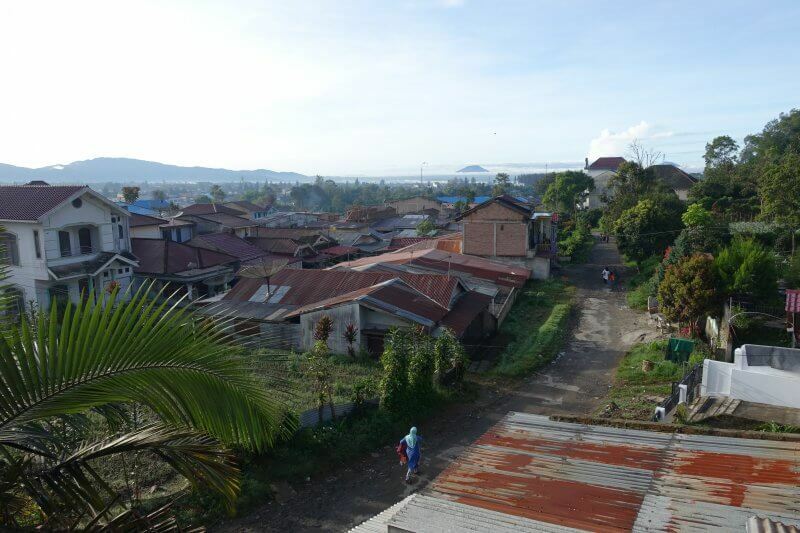 There’s more signs of the culture and history of the Batak people in Ambarita. For instance, many of such elaborate structures can be found, and they’re actually family tombs. The larger and more elaborate ones belong to the more well to do families. 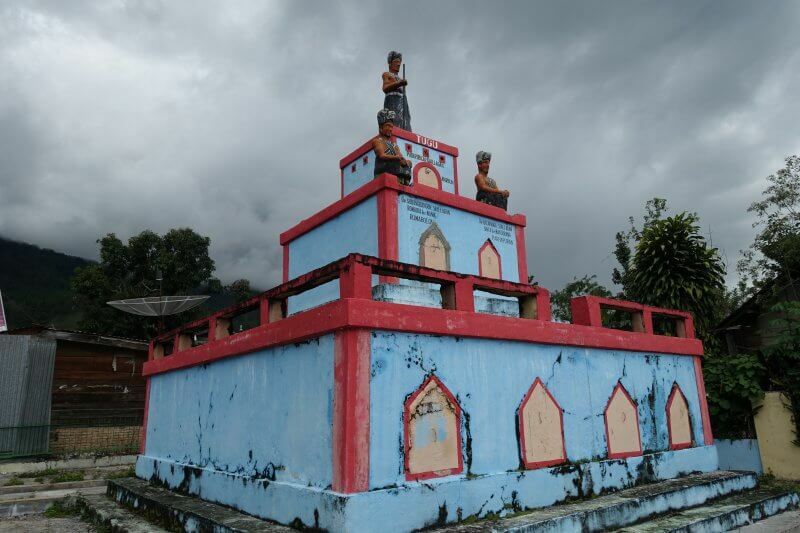 Family tomb of the Batak people on Samosir Island. 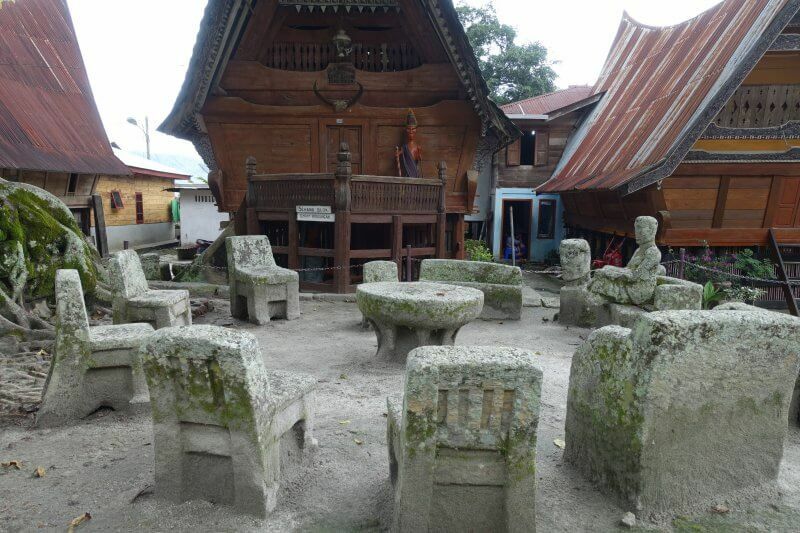 But perhaps the most well known of attractions at Ambarita are the Stone Chairs of King Siallagan. Here, over 200 years ago, the king and his officials sat to decide the fate of captured enemies, some of whom were executed at a second set of stone chairs and tables in the same compound before they were eaten. Yes eaten. Fortunately Batak people no longer practice cannibalism. Entry to the compound costs 5,000 IDR. Not that much to see, but interesting story and worth a look around. This local market opens every Thursday. We didn’t see any other tourist there so it’s almost as local as it can get. Fresh food, cooked food, and daily items. The cooked food section at the market. 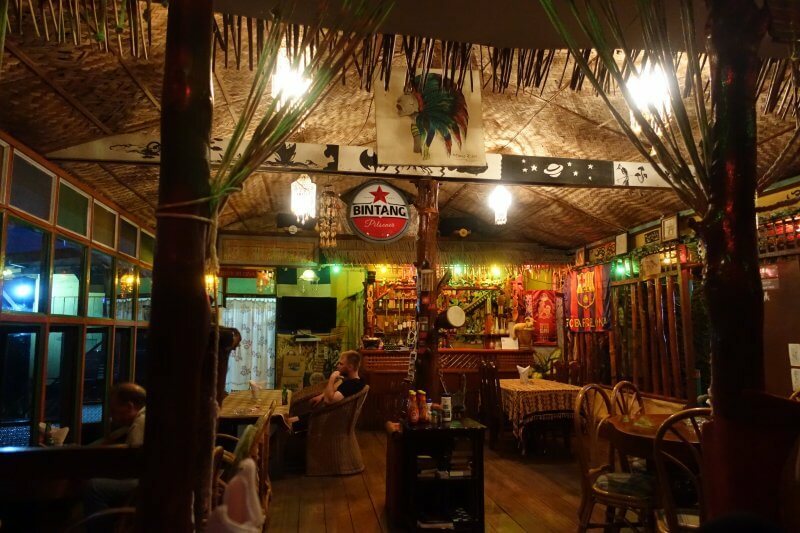 If you’re between Ambarita and Tuk Tuk, why not enjoy the restaurants along the way? 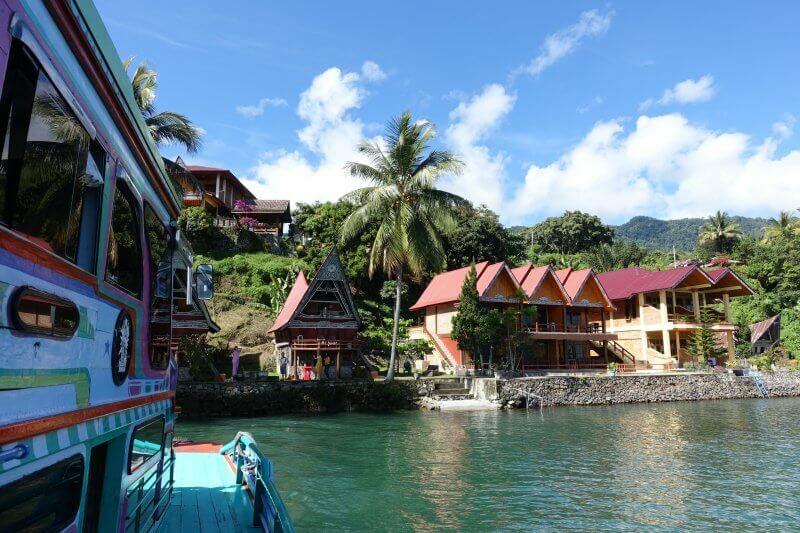 Mas Cottages offer al fresco dining by the lake side, and Joe’s Restaurant nearby offers a highly rated ‘Chicken ala Batak’. Best of all, food isn’t expensive at any of these places. 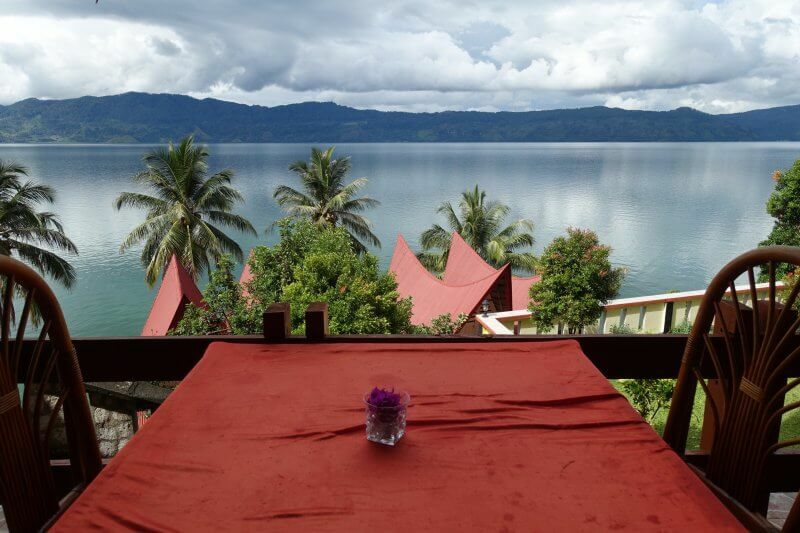 Just the right view for lunch at Lake Toba, at Mas Cottages. I’m still working on my food photography, this photograph doesn’t do it justice. We had to wait a (really) long while for this to be cooked from scratch, but it was flavourful to the last drip. 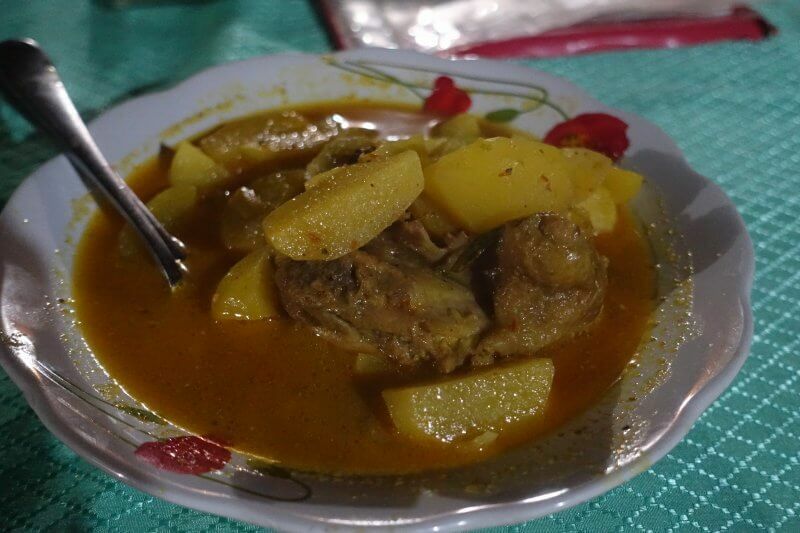 Chicken ala Batak at Joe’s Restaurant. The next day we booked a one day tour by car of the surrounding areas. An alternative would be getting around on rented bikes but as we weren’t experienced and roads are quite bad after Ambarita, we went with the safer option instead. I can’t remember the exact cost but it should be in the range of 600,000-800,000 IDR. First, towards Tomok to check out some tall waterfall from afar. 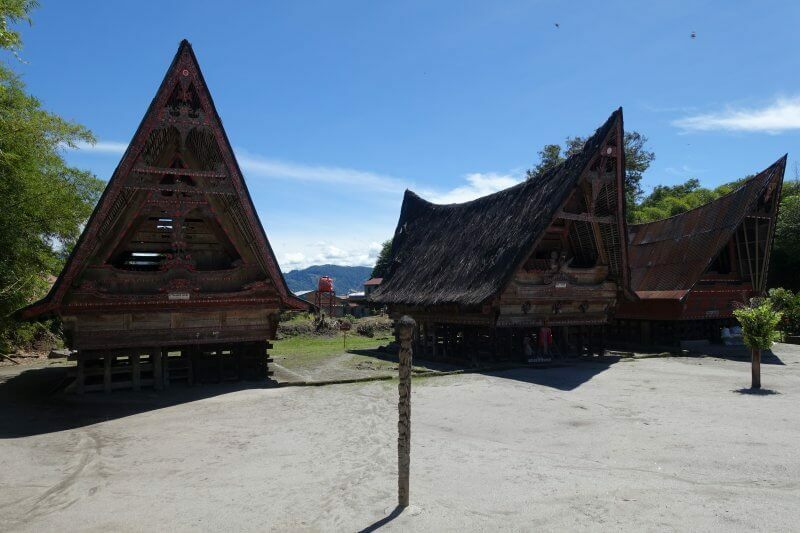 Driving anti-clockwise around Samosir Island, the first stop is at Huta Bolon Simanindo Museum, where the highlight is a traditional dance. The stone chairs at Ambarita can also be your first stop if you hadn’t visited. 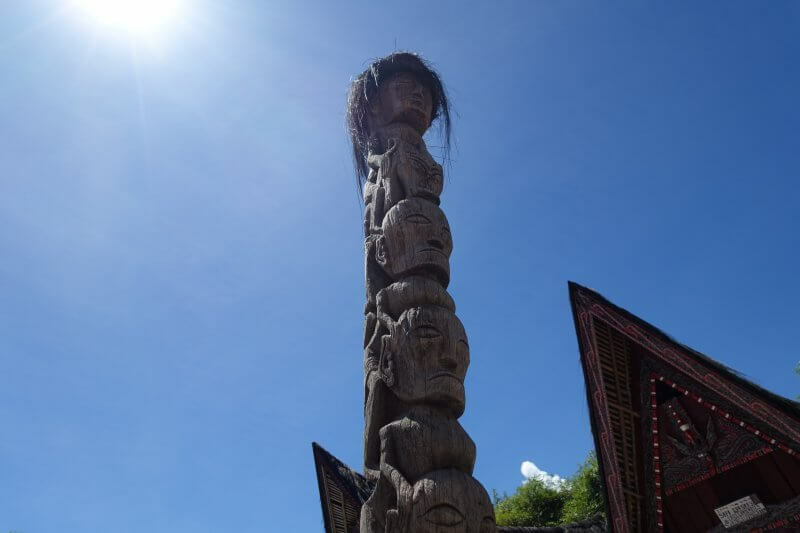 Unfortunately it was Good Friday when we visited, and as the Batak people are predominantly christians, schedules for the dances were shifted back and we had to give it a miss. The traditional houses was interesting to look at, but seem more or less the same as the ones at the Ambarita stone chairs. The museum itself had a few artefacts, but wasn’t particularly interesting. 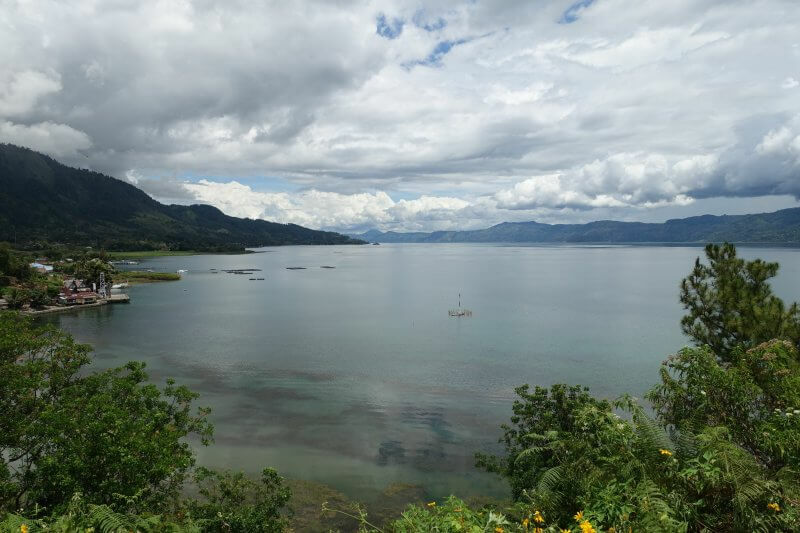 The drive continued along the coastal route, passing rice fields and mountains before crossing to the mainland on a bridge at the south of Samosir Island. The roads aren’t crowded so it would be possible to request to stop for photographs. Just don’t spend too much time along the way as there might not be enough to complete your intended itinerary. Rice fields and green hills. After crossing the bridge to the mainland the road winds up the hills to Tele Tower Viewpoint. As the road climbs the views get more and more spectacular. On the road towards Tele. Entrance to the tower is 7,000 IDR. Enjoy the spectacular panoramas from the tower, especially on a day with nice weather. Without mentioning it these views could have passed off as some much more exotic sounding destination. Though Sumatra can actually sound quite exotic too. 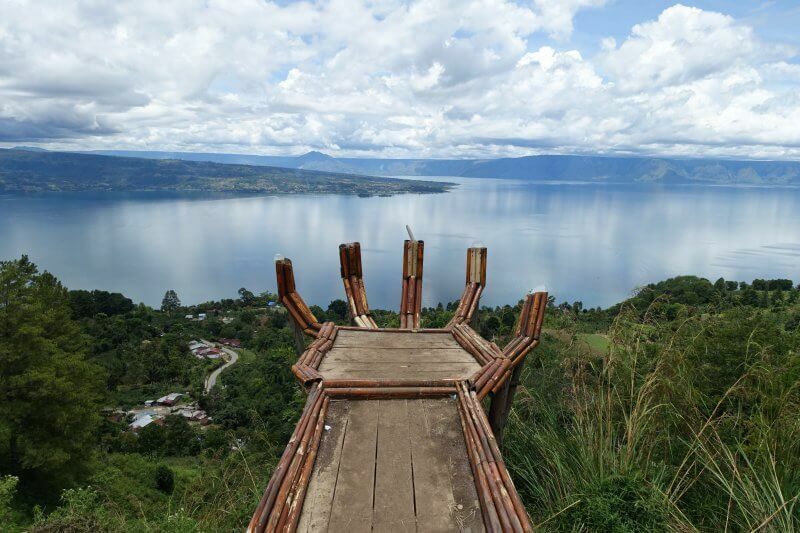 Lake Toba from Tele Observation Tower. Gunung Pusuk Buhit, from Tele Observation Tower. 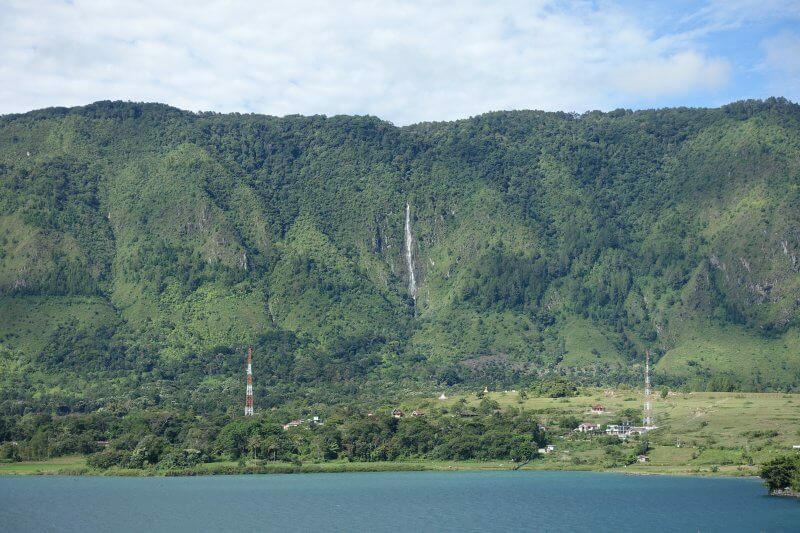 Not far from Tele Observation Tower is Air Terjun Efrata. Honestly not that amazing a waterfall but since you’re already here why not. Entry costs 5,000 IDR. Looks like a nice place to relax, but the weather when we arrived was rainy so we didn’t hang at the waterfall long, more time at the coffee stall outside the waterfall drinking coffee and people watching. The rest of the car ride to the hot springs were very scenic too, passing valleys where rice fields stretch from end to end. 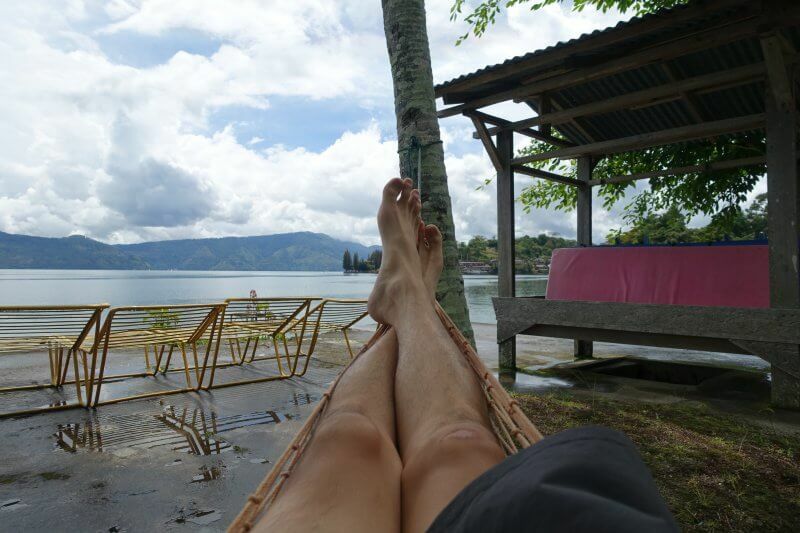 The last stop before returning to Samosir Island is Aek Rangat Hot Spring. There’re a couple of hot springs in that area. We went to the next to Edys Dayanto Restaurant. There’s a side which is free for use for if you purchase food and drinks at the restaurant, and is separated by gender. There’s also a private one which is available for 100,000 IDR. As there were 3 of us we decided to go for the private one, which seemed cleaner too. Basic but exactly what we needed for a relaxing hour. 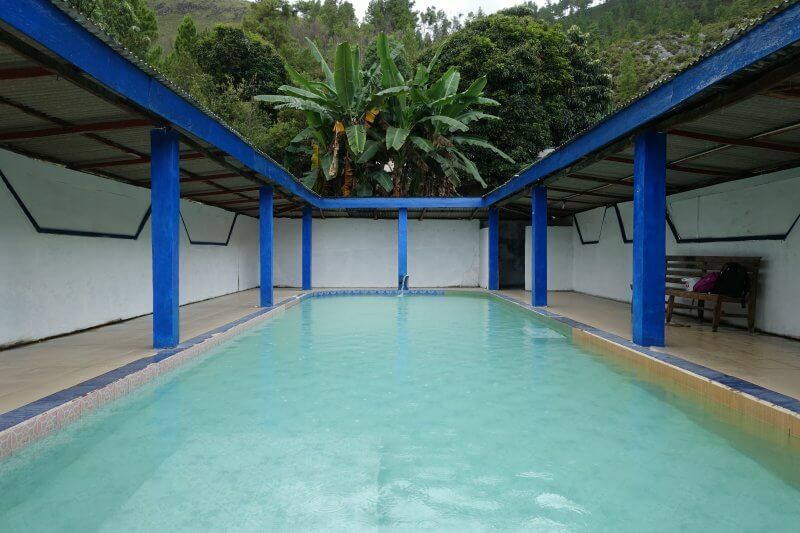 Private hot spring for 100,000 IDR at Lake Toba. 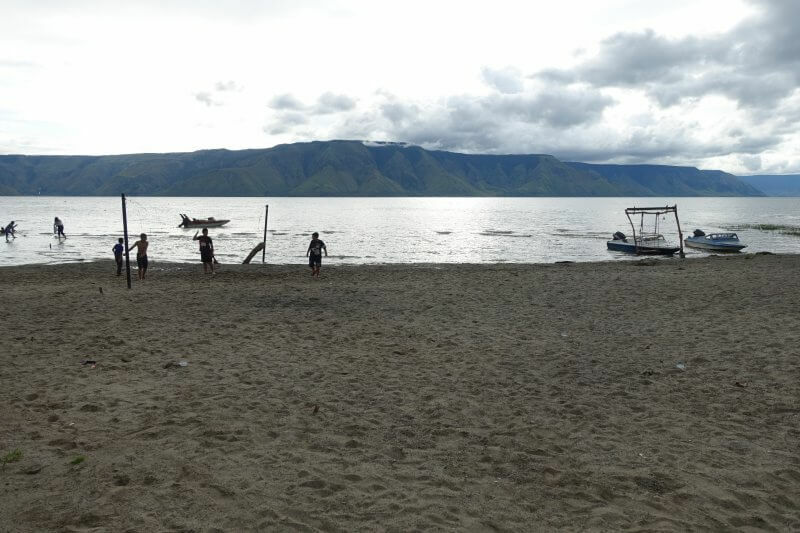 Back on Samosir Island, the next stop is Parbaba beach. I wouldn’t have expected to find a white sandy beach on an island that sits in a volcanic lake, but this was what Parbaba beach was. 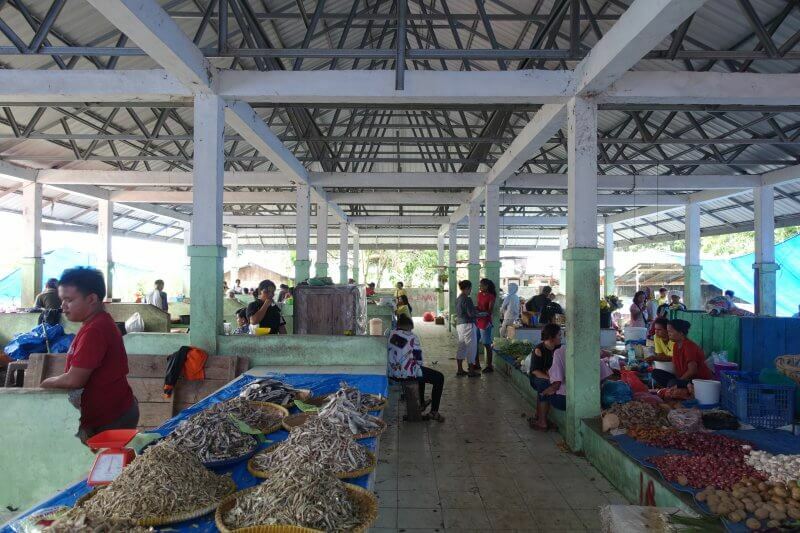 Not exactly paradise, but just with Ambarita’s market, it’s nice visiting a place with locals only, and not being stuffed in your face with stuff for foreign tourists. The beach is free, and there are water activities you can try out at the beach. We didn’t try any as it was getting late. And that was it for the one day tour. There’s supposed to be one more waterfall on Samosir Island to visit but it was closing on 5 and the driver was in a rush to get home, so we headed back to our guesthouse for a massage. Most guesthouses will help you to call in masseuses to the guesthouse if you want a traditional massage, and they don’t cost much. So just sit back, relax, and enjoy the massage! 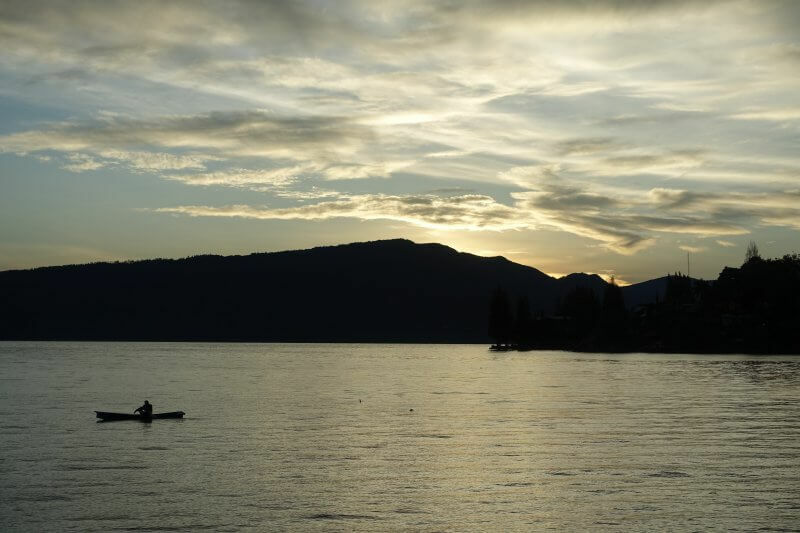 Last sunrise at Lake Toba. It’s necessary to check with your guesthouse on the ferry schedules at least a day prior. 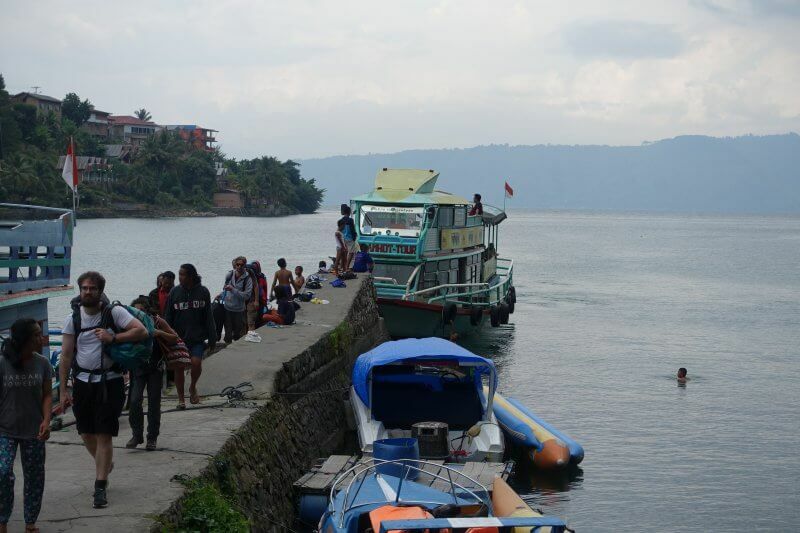 If the ferry stops by the guesthouse, your guesthouse has to inform them to pick you up. Even with this personal service the ferry ride back to Parapat was just 20,000 IDR. On the ferry, leaving paradise. The waterfalls and houses getting smaller. 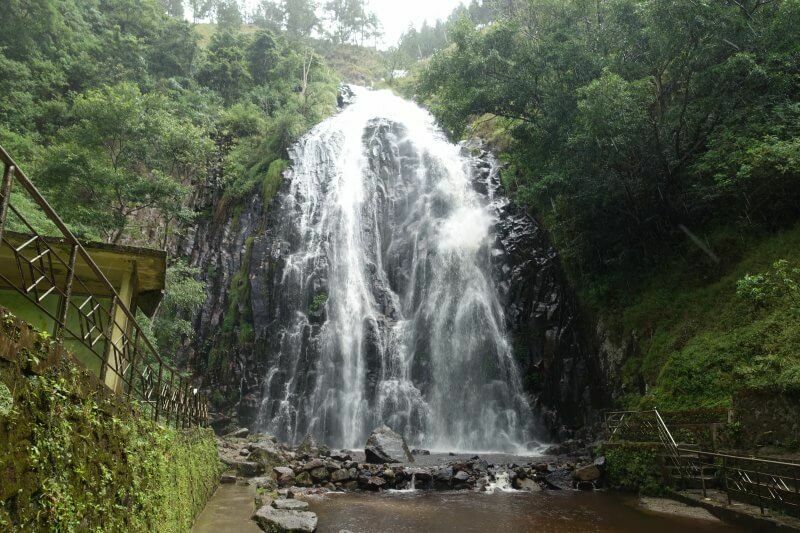 Up next is the famous Sipisopiso waterfall. We got a driver from our guesthouse in Berastagi to pick us up from the harbour. 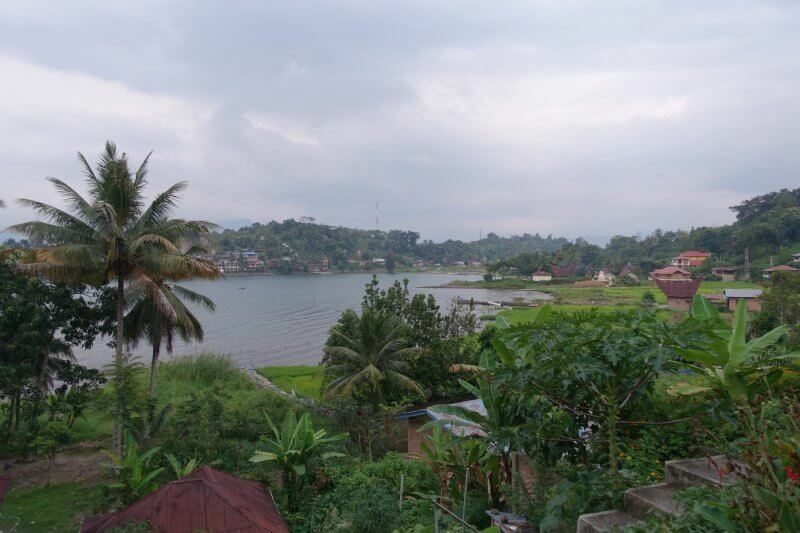 It costed 700,000 IDR (per car) for the ride from Parapat to Sipisopiso, then to Berastagi. 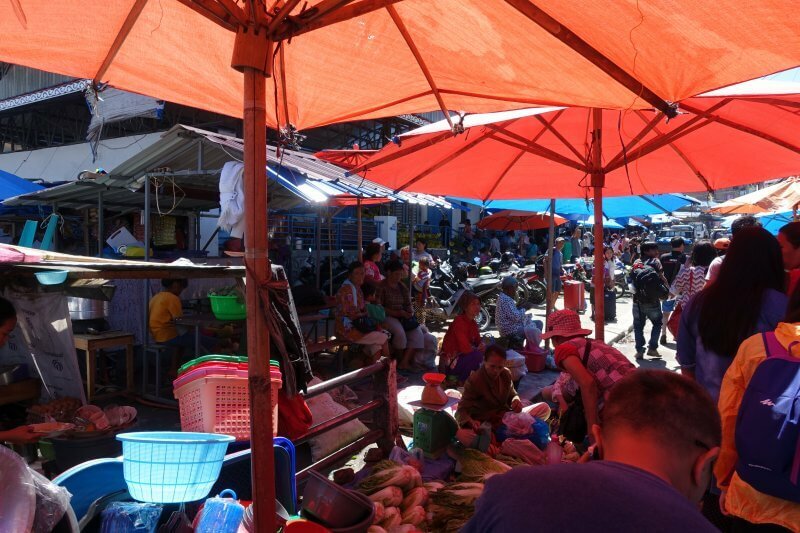 The busy market beside the harbour at Parapat. The roads around the harbour and market were packed, and it took awhile to get out on to the main road. Things were much more peaceful after that. 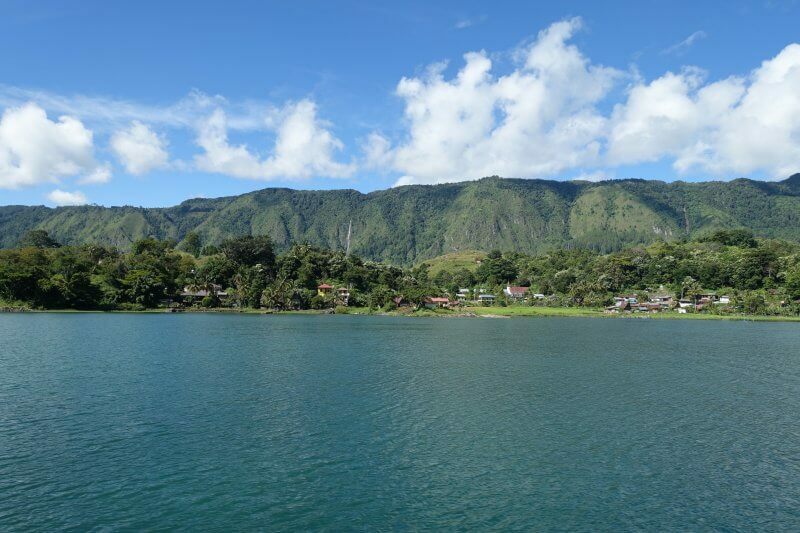 After a few hours driving on the road next to Lake Toba, the lake was still next to the road. There are many places to stop for coffee along the way. We stopped at Batu Lihi Star. 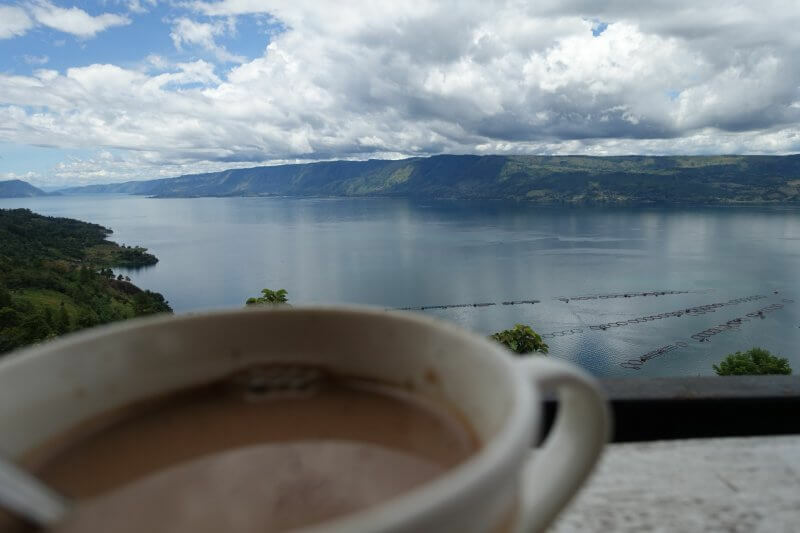 Coffee break by Lake Toba. There’s no shortage of places to take photos for those few hours driving by the lake. Here’s another one we stopped at. Most of these structures have a price written beside them but the people there didn’t seem to enforce it. 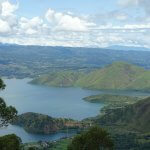 Another viewpoint by Lake Toba. 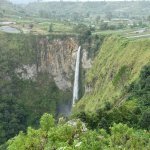 Finally, at Sipisopiso waterfall. It’s about an hours’ hike down to the base and back up. The waterfall was stunning. The river falls off the cliff and hurtles down a hundred meters. Near the base everything is shrouded in a cloud of mist from the force. 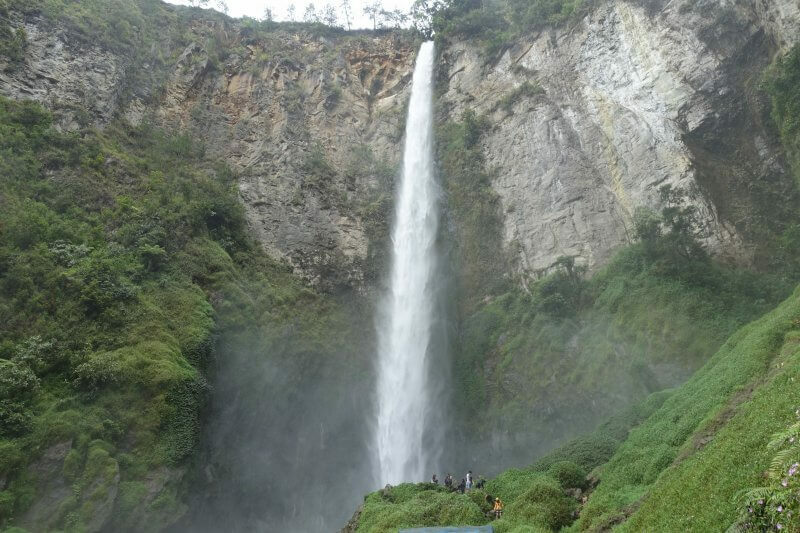 Definitely a highlight in north Sumatra. Traffic was heavy towards Berastagi and we arrived just before nightfall at Smiley’s Homestay. A sumptuous dinner was waiting, of local dishes prepared by the Smiley’s wife. 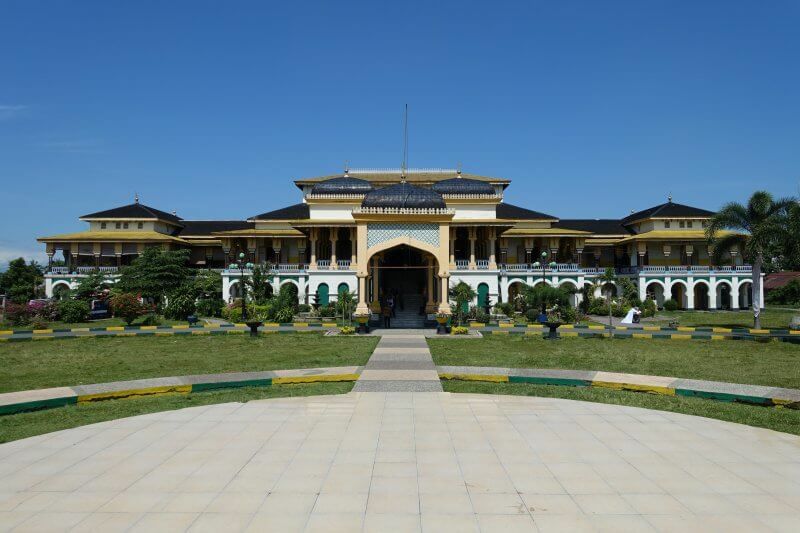 There doesn’t seem to be many accommodation options at Berastagi when I visited, which is why we picked the homestay, but it turned out to be a very good choice. We had a nice conversation over dinner with Smiley, his wife, and 2 tourists who had been on a tour with Smiley that day. Nights in Berastagi are a little chilly as Berastagi is about 1,300m above sea level. Comfortable enough to sleep without air-conditioning or fans. 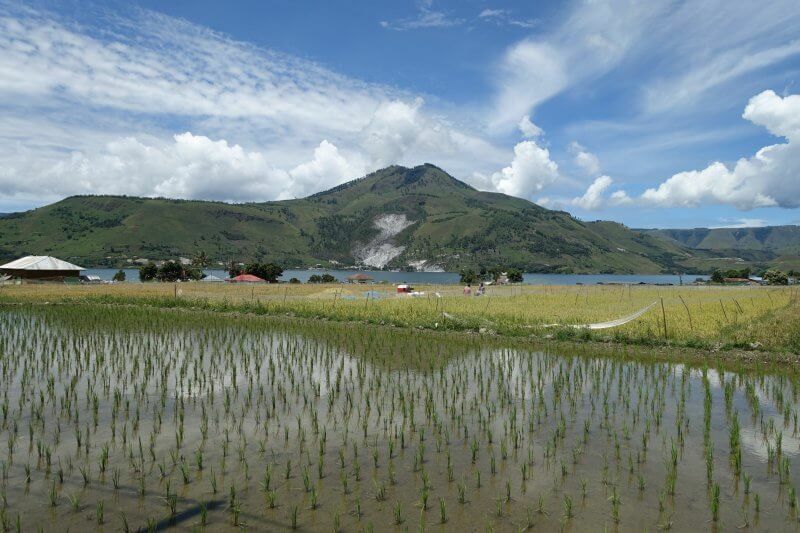 The next morning we woke up all ready for another highlight of Berastagi, a hike to Gunung Sibayak, an active volcano. Smiley is a tour guide for the region too, and we did the hike with him. He is very knowledgeable of the forests and volcanoes and I’d definitely recommend him to whoever is looking for a visit around Berastagi. The next morning, view from our room. 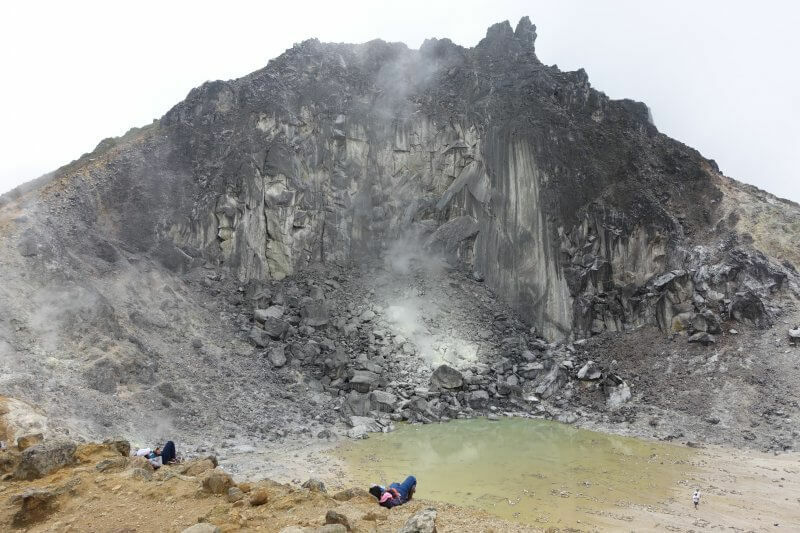 It should be possible to do the Sibayak volcano hike without a guide, but if you can afford it I’d recommend getting an experienced guide like Smiley. 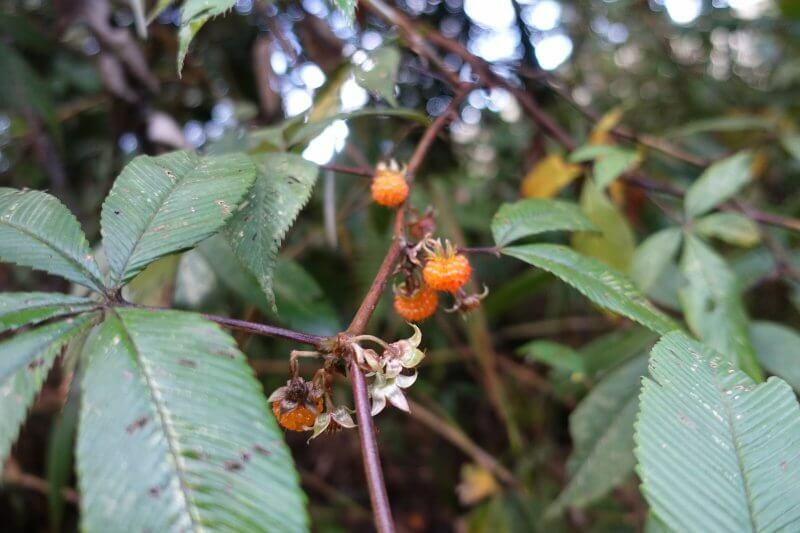 Not only will he be able to point out interesting sights and facts along the way, such as edible fruits and leaves that keep mosquitoes away, it’s definitely a good idea to let an expert tell you where it is actually dangerous, and where it may look dangerous but is safe to check out. The sulphur vents turned the surface into some alien landscape. I wouldn’t have dared ventured this close without a guide. Very mysterious. And very smelly. 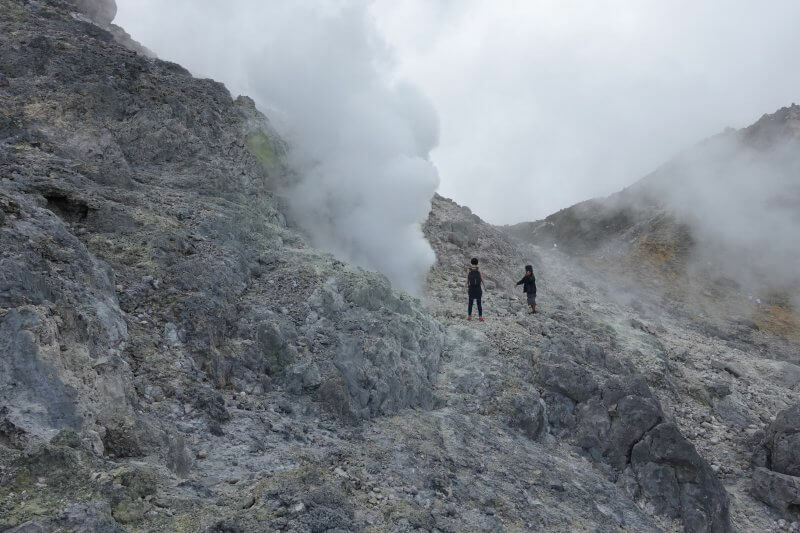 Sulphur vents on Gunung Sibayak. 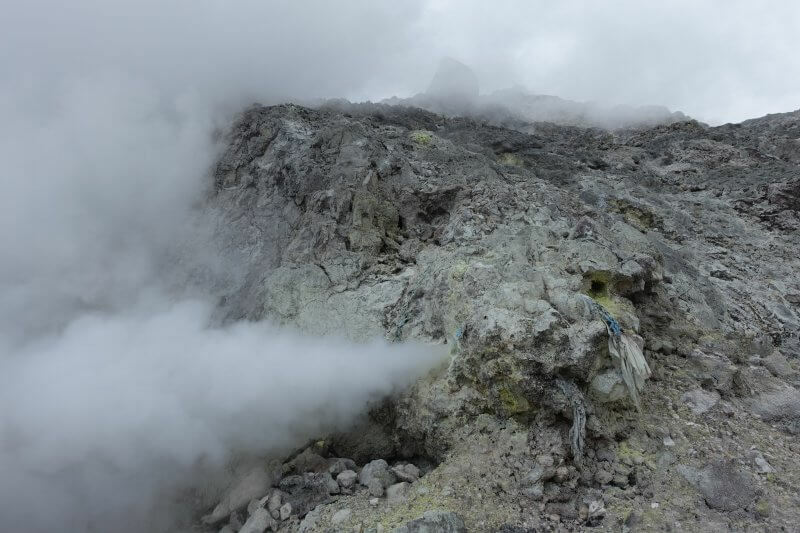 Up close with one of the more active vents. According to Smiley, the violent as they may seem, the vents were what was keeping Sibayak from turning into it’s more violent neighbour, as the pressure is constantly released. 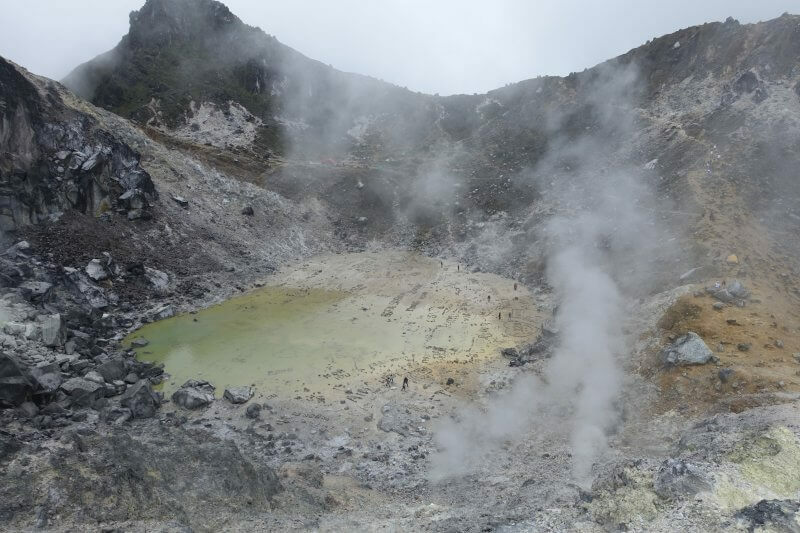 The crater of the volcano, sulphuric acid down below. The partially collapsed peak of Gunung Sibayak. It is possible to head to the hot springs nearby after the hike. 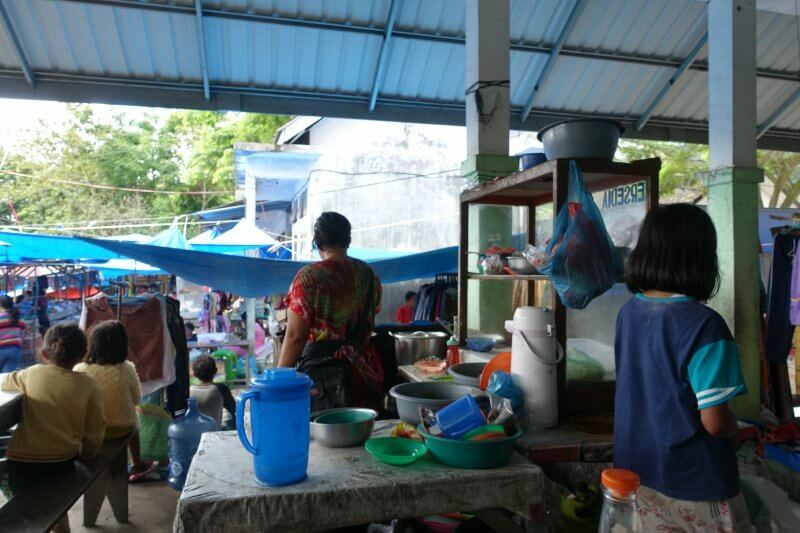 However as we had already visited hot springs just 2 days back, and read that the ones here were dirtier, we gave it a miss and headed back to Berastagi for the fruit market. 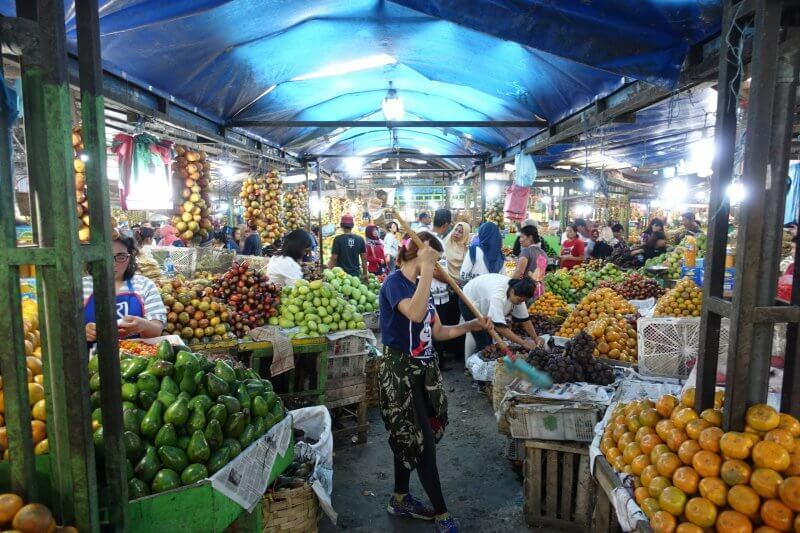 With the fertile volcanic soil and cooling climate, the lands around Berastagi is suitable for growing a range of fruits and vegetables, much of it on display at the Berastagi Fruit Market. Might not be the cheapest since this is tourist oriented, but still seems cheaper than the city, and definitely much fresher. Fruits of every colour at Berastagi Fruit Market. There are buses from Berastagi to Medan that go for 10,000 IDR per person. 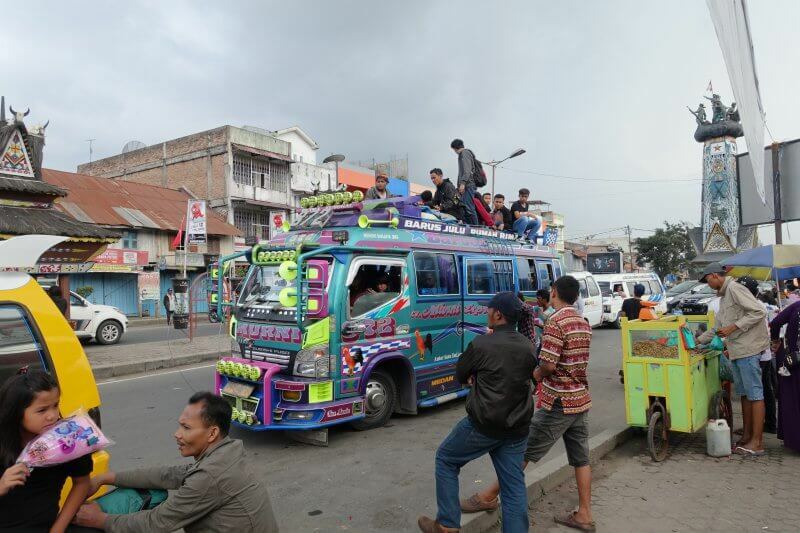 There are also vehicles that ply the route for 15,000 IDR per person. Vehicles, including vans, trucks, and anything that can take people. The day we left was a peak travel period and the buses filled as soon as they stopped. Not just to the door but to the roof. In the end we squeezed into the back of a truck with kids heading back to the city after their weekend break. 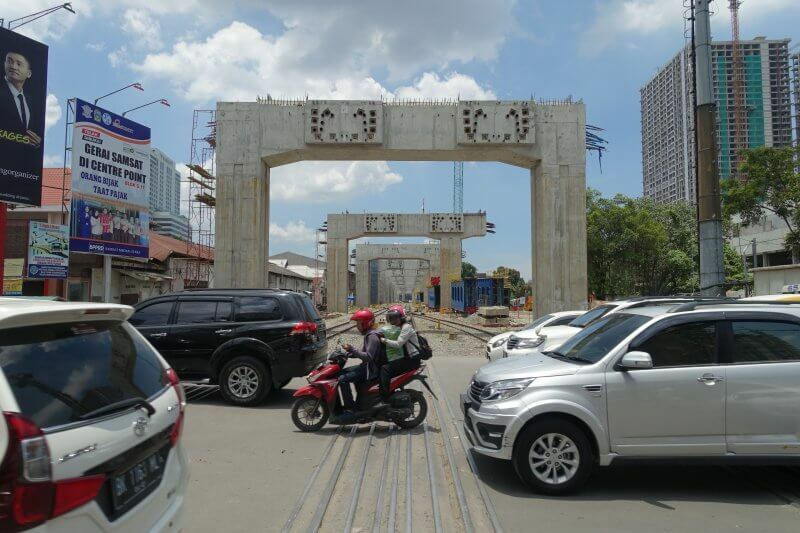 The roundabout to get transport back to Medan. Buses filled to the top. We were glad to make it to Medan in one piece. Dropped our bags, caught our breaths and headed for dinner in Medan’s Chinatown, at Jalan Semarang. 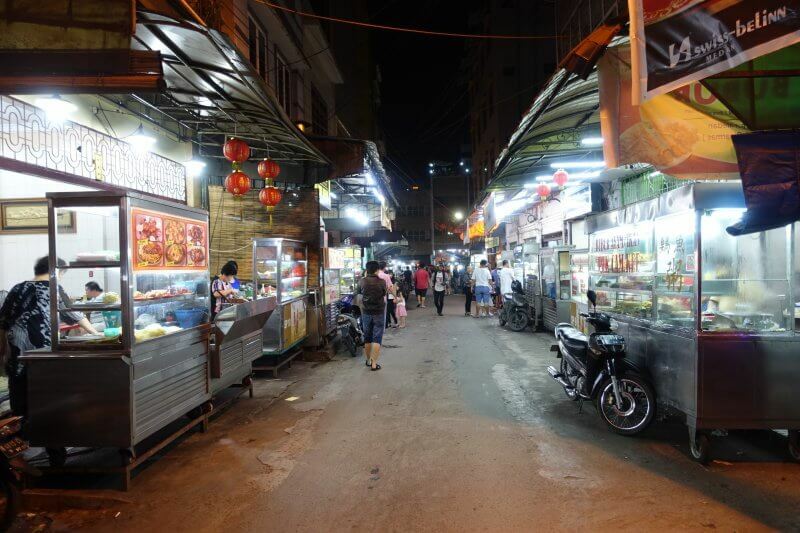 There was a vibrant street food scene there, and we wasted no time diving into the food. Just 2 of the many stalls. The number of dishes just from one stall! There was common seating areas for the different stalls. Each of these areas were managed by a few people, who took note of the dishes purchased. Only when you’re leaving do you have to pay for all that you’ve got at one counter. Pretty convenient. At the seating area along Jalan Semarang. 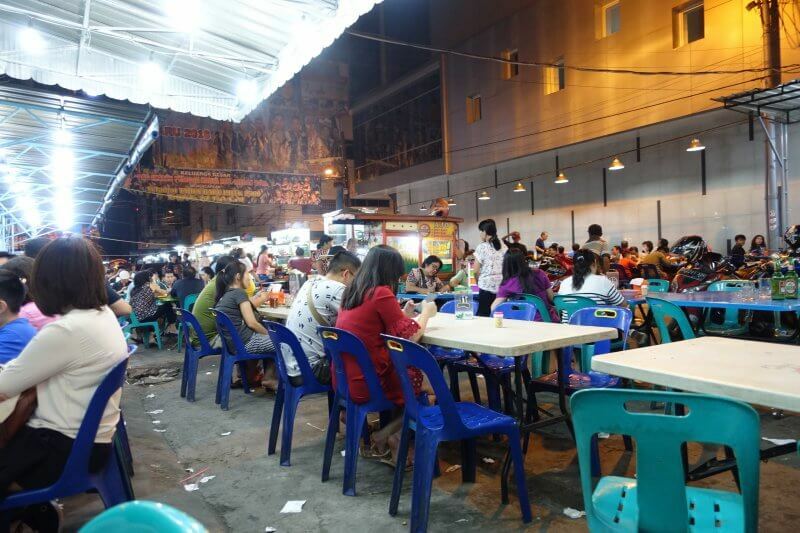 Just 2 blocks down, at Jalan Selat Panjang, there is another stretch of food options. Here most of the shops are restaurants. 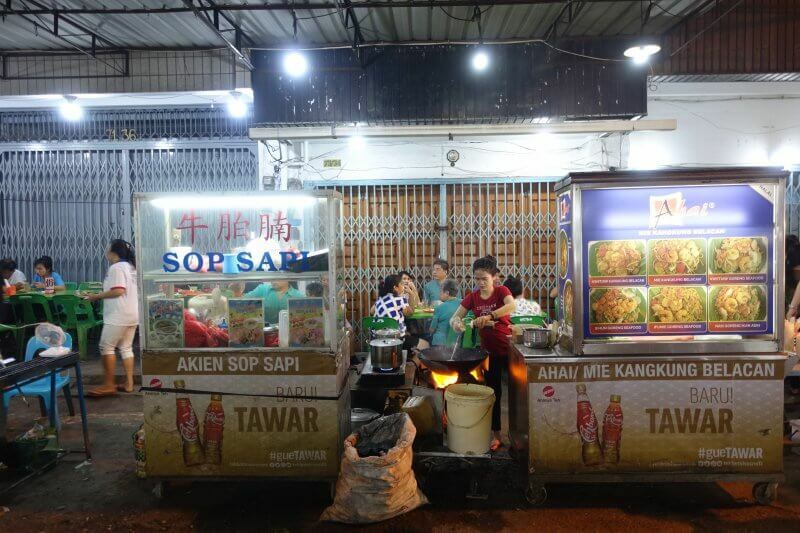 The most popular stall is probably Mie Tiong Sim, which sells dumpling noodles. Don’t be fooled by these empty streets, the restaurants were filled! 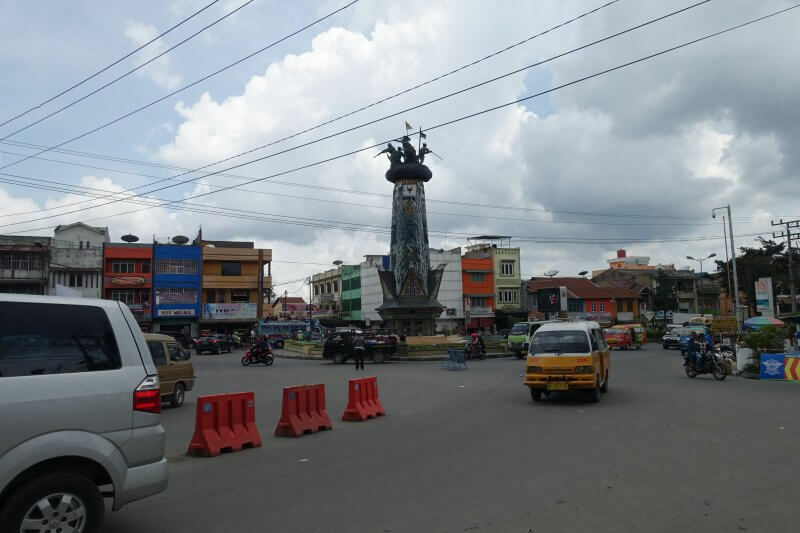 The last day of the itinerary in north Sumatra, still enough time for a quick tour around the city. 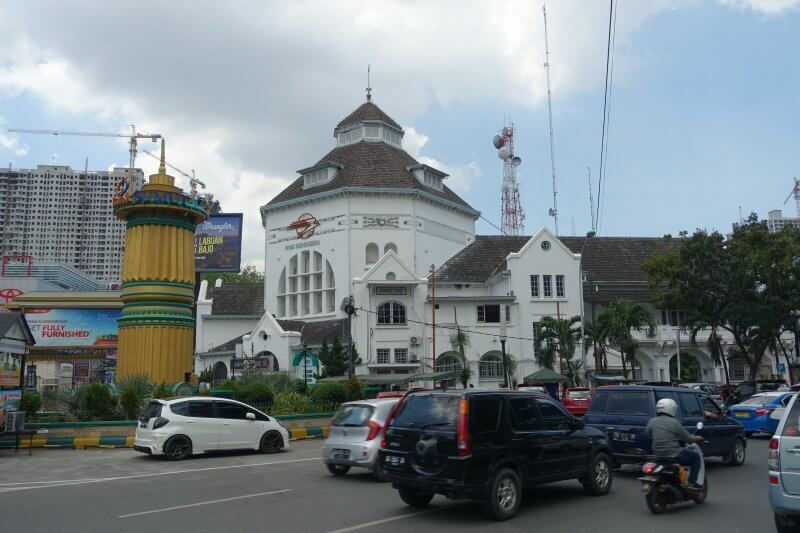 Maimun Palace is over a hundred years old, and is a landmark in Medan with its distinctive architecture and interiors. You’d be able to finish this pretty quickly and perhaps learn a little about the Sultanate of Deli along the way. Entrance fee is 5,000 IDR. 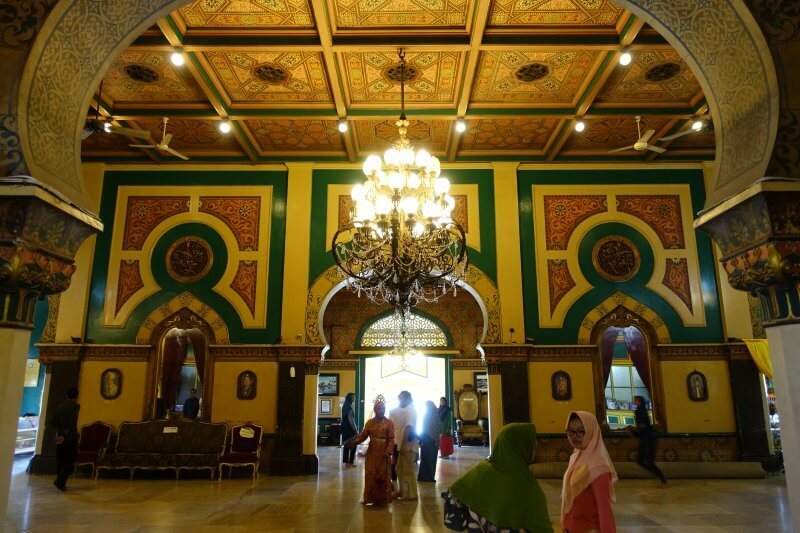 Just a short walk from Istana Maimun is another impressive building in Medan, the Masjid Raya Al Mashun or Great Mosque of Medan. 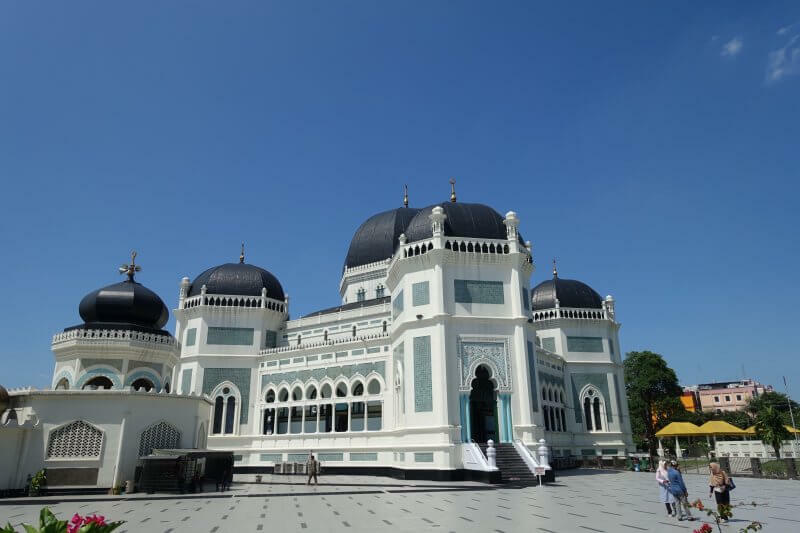 This grand mosque combines the architectural styles of various cultures. It is possible to enter but we gave it a miss as we read that there wasn’t much to see inside. 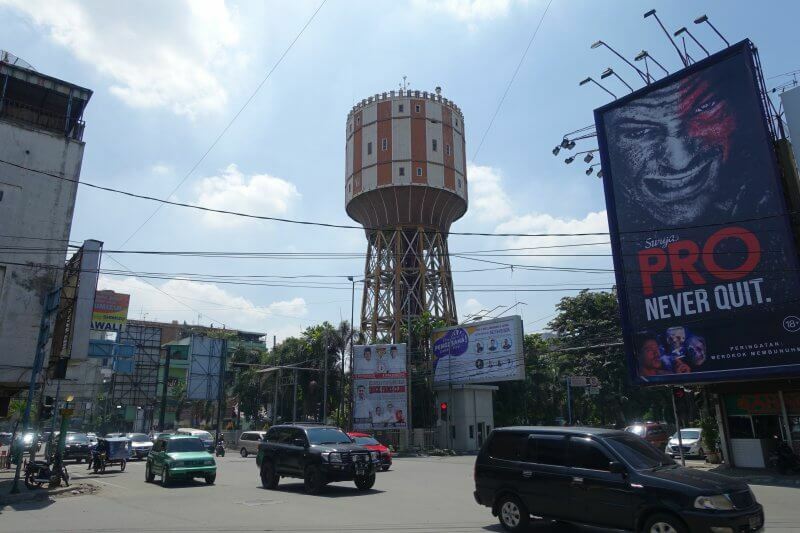 The Tirtanadi Water Tower is another well known landmark in Medan. It was built by the colonial Dutch government in 1908. 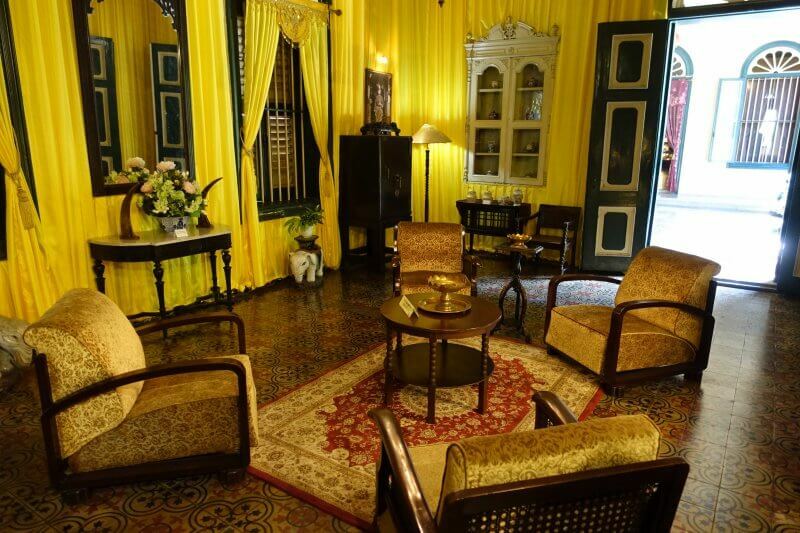 Tjong A Fie was a wealthy merchant who contributed much towards the develop of Medan in the early 20th century. 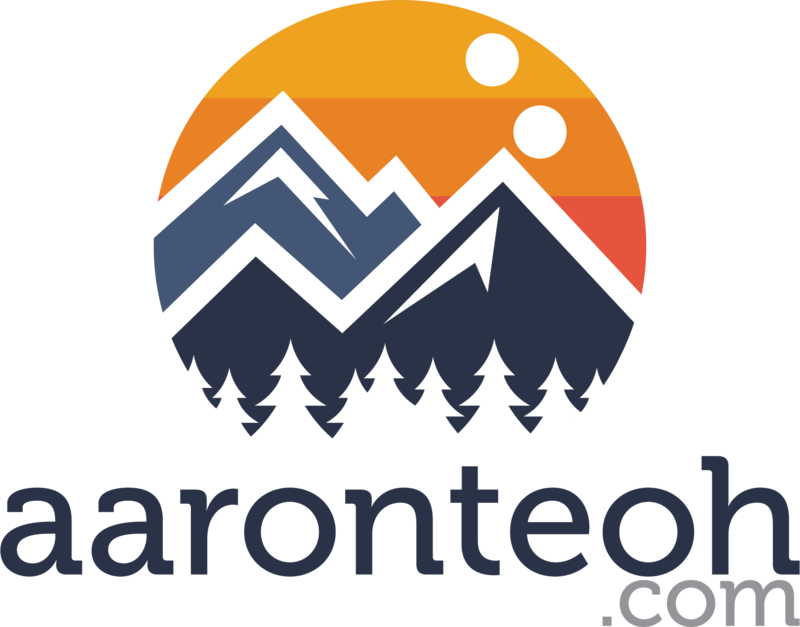 He build up successful businesses and became a prominent leader in the community. A stroll around the city followed by a visit here sets couple of loose pieces into place, as his contributions can still be found throughout the city, and you can learn more about his life and contributions here. The courtyard, and bustling city just outside. One of the rooms for receiving guests. 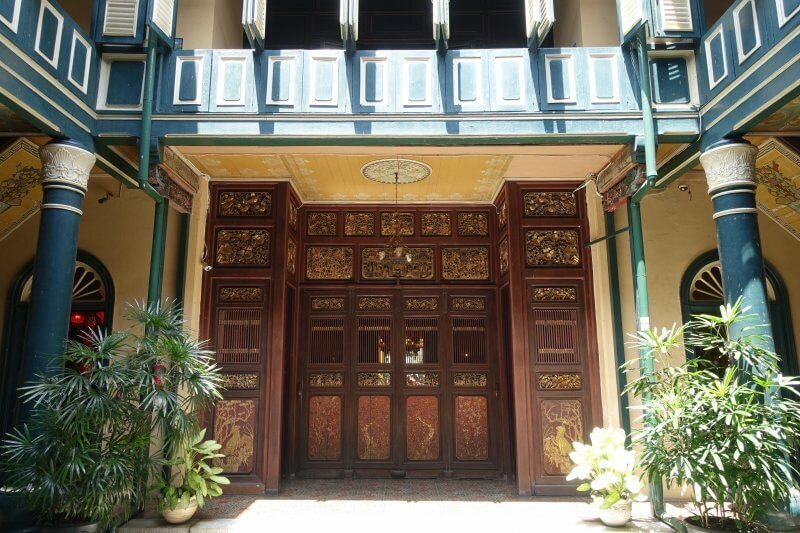 Tjong A Fie Mansion is in the Kesawan district, which is also home to other notable historic buildings. Here’s a handful. 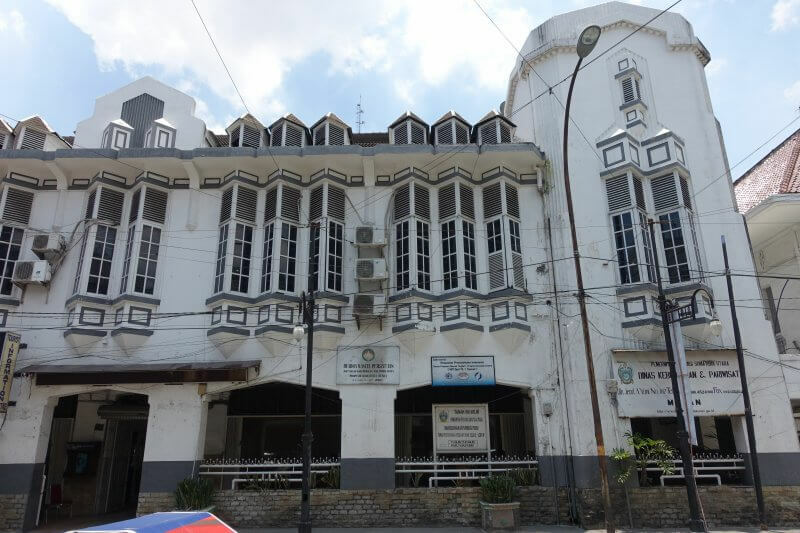 The BKS PPS building (in Indonesian, can be translated on Chrome), previously the AVROS (Algemeene Vereeniging van Rubberplanters in Oostkust van Sumatera/ General Association of Rubber Plantations on the Coast of East Sumatra) building during colonial times. Another old building. Not sure what this was. 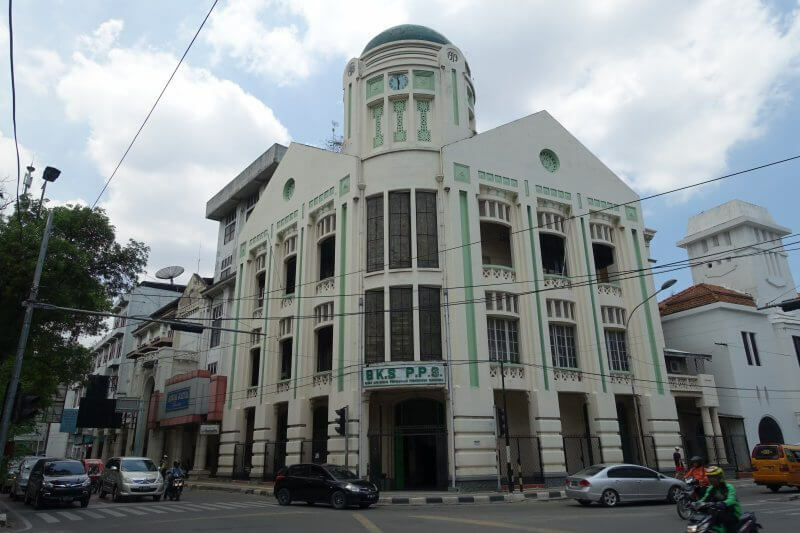 Kantor Pos Medan (Medan Post and Telegraph Office), 1911. And that wraps up 6 days in north Sumatra. Have some time left? 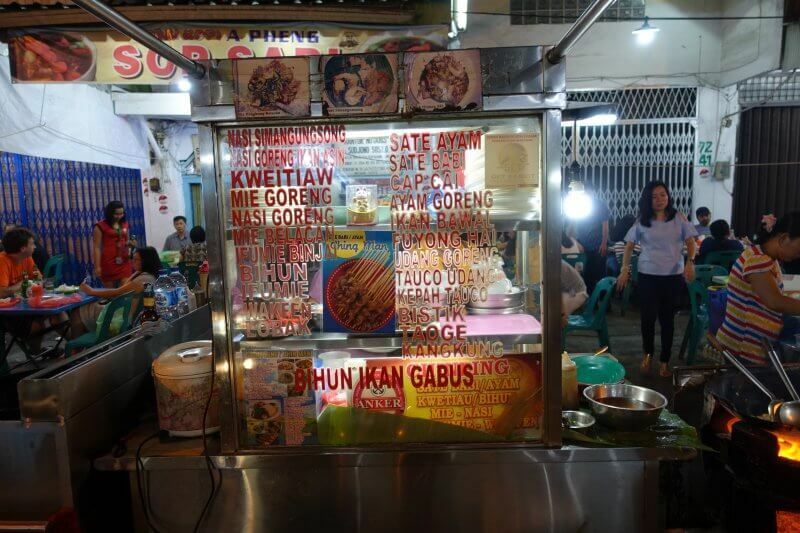 Check out more of the delectable food options in Medan, or drop by the museums. We had an afternoon flight to catch, so we hopped on the airport express and were soon out of Sumatra, planning for our next adventure. New railway lines being built through the city.